Revitalizing The Mental Militia! Poll and Discussion! -32F on my thermometer. Don't know the windchill, but it is cold here in middle minnesocialist. surprising the snowflakes here have not tried to open warming centers for the antelope here. Don't say that too loud, they may hear ya and think the had a great idea. 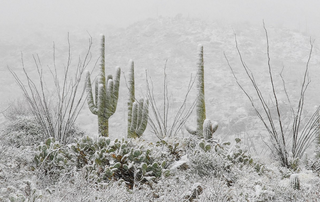 PHOENIX (ADOT) -- Winter weather and crashes have closed multiple highways in northern Arizona, according to the Arizona Department of Transportation. Drivers should delay travel across northern Arizona during the current winter storm because heavy snow or crashes could make roads impassable. There is no estimated time to reopen any highways and additional closures are possible depending on weather and crashes. 30f with snow falling in Wyoming.